Get ready for the fireworks! This salad is perfect for Fourth of July family celebrations, but will make a colorful edition to any summertime picnic. Best of all, it’s filled with summer-fresh fruits, luscious salad greens and a tangy vinaigrette that lightly dresses the patriotic platter. 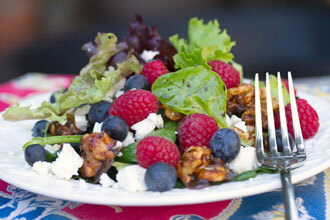 Simple and easy, you can prepare all the ingredients in advance and compose the salad just before the party.